Yes, You Can… And Look What I Got! Posted on July 9, 2008	by Linda S.
I’ve had several emails and comments left asking if it is okay to sell the products made with my free crochet patterns… The answer is… ta da… Yes you can make, sell, or donate as many as you like as long as you don’t sell the pattern itself and as long as you give credit back to me as the designer. Please respect the effort that went into these patterns. 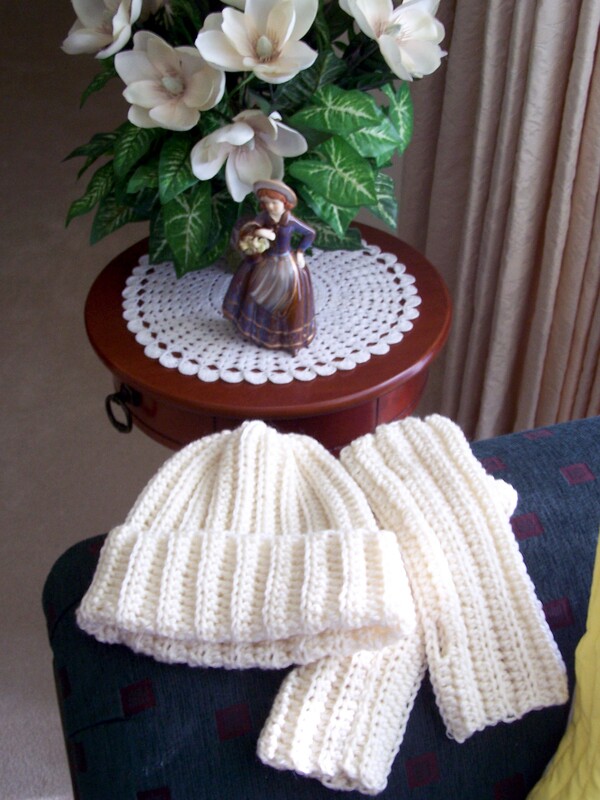 The patterns listed in the Free Patterns section of my site are the only ones that are my own creation. In the body of Fabric Follies Two, I have linked back to many sites that have free patterns of several different techniques. For those new to the internet, these links go back to another person or company site and I am just passing along to my readers what that site has to offer. I cannot send you their patterns or their products. I will try to help you find what you are looking for, but it would violate their copyright to send to you directly. And on to my current news! I was wandering through ebay looking at spinning wheels when my DH came wandering by… next I new he was wandering the internet and looking for spinning wheels… and he found the most enchanting little thing I have seen in a long time. This little wheel is about 2/3 the size of my Kromski Prelude, is put together with square pegs, wooden screws and leather hinges. After inquiring about it via email, it seems that DH had served in Germany in many of the same places and around the same time as the owner’s husband. 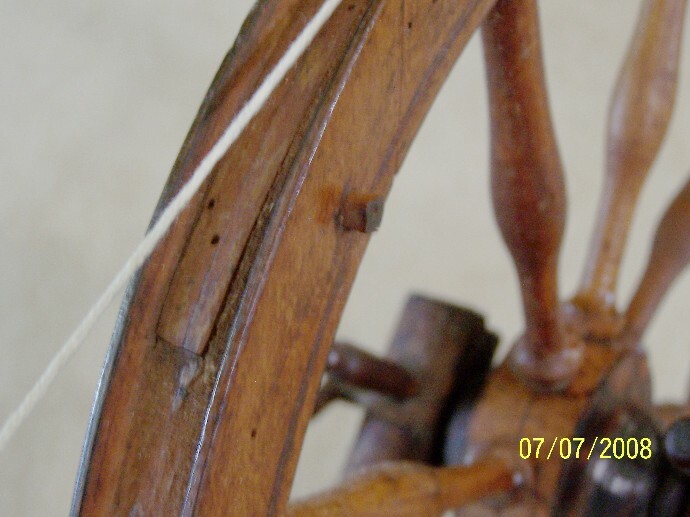 ;o) This caused a flurry of emails back and forth and we found that this spinning wheel was purchased as an antique while they were stationed there in Germany in the ’70s. So we bought it. It arrived 3 days ago. I put up an inquiry about it on my Yahoo Kromsky group and received some great insights re: this wheel. It was very probably made in the early 1800’s and possibly earlier than that. We find evidence that it was probably hand made. This is one of the square pegs used when building the wheel itself. 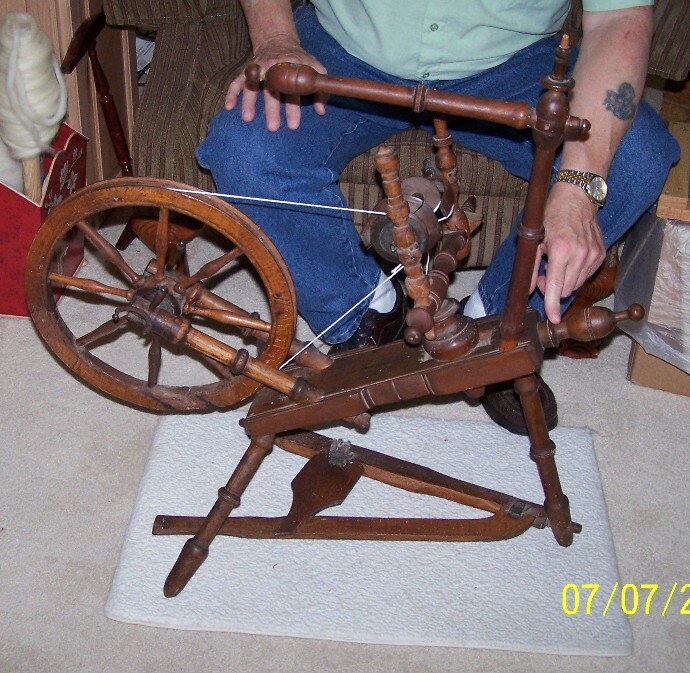 This entry was posted in Antiques, Crafts, Handcraft, Handwork, Historical Textile, Spindling, Spinning. Bookmark the permalink. 1 Response to Yes, You Can… And Look What I Got! Regarding the thirsty wood of your charming antique spinning wheel, why don’t you contact the makers you sent me to for my pocket loom? As you know, they are beaucoup experienced in what woods want!